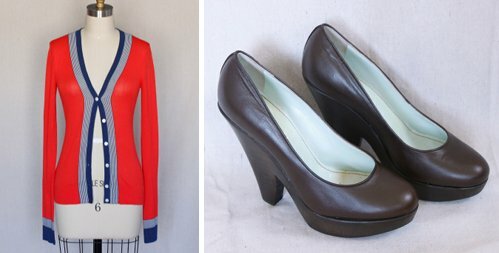 I just acquired this nautical sweater by Trina Turk and brown leather platforms by Tracy Reese and I can't wait to wear them. I bought them from a fashionable friend who hosted a sale of her barely worn clothing. She held the sale at her home, served drinks and hors d' oeuvres and used different rooms display clothes and try things on. This would also be a great thing to do with a couple friends, maybe set up a few sections where each person could display their items and then invite everyone you know. It's a high profile garage sale where the seller makes more than they would at a consignment store and the buyer pays less. 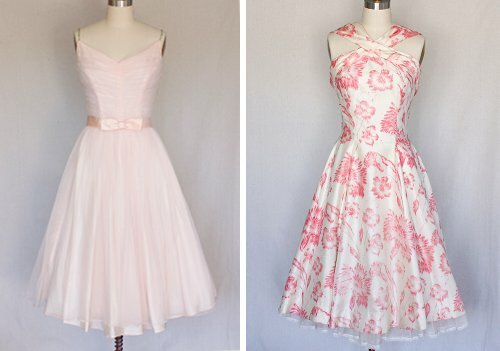 These two dresses will be in the shop tomorrow. I was going to save them until Spring, but with Valentine's Day and Easter in the near future, I am sure they will find good homes!